Reed Gunther » Archive » REED GUNTHER Vol. 2 in Stores Now! REED GUNTHER Vol. 2 in Stores Now! Wowee! 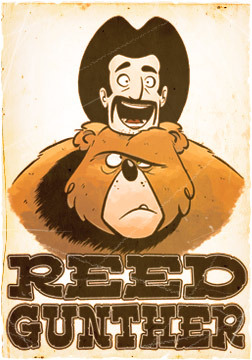 The second trade paperback collection of that silly bear-riding cowboy hits comic shop stands today! Chris and I are incredibly happy to have this second fantastic collection out there and we did our best to cram it full of awesome stuff! Today, Chris and I will be signing copies at HOUSE OF SECRETS in Burbank, CA from 1-3PM! Swing on by during your lunch hour! - An introduction by hilarious Simpsons Comics writer, IAN BOOTHBY! - Issues #6-10 with corrected spelling errors! 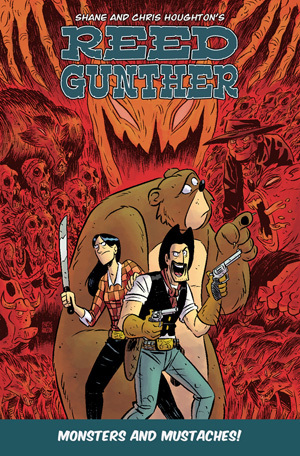 If anyone can find a change (spelling or color change– here’s a hint, someone’s shirt changes color in one panel but it’s now fixed) between the single issues and the TPB, we’ll send you a free sketch of Reed Gunther! - Seven pages of sketches and process work with commentary from me and Chris! - A walk through of how a page of script becomes the final drawn and colored page! - A collection of Reed Gunther short stories including “Animal Intimidation”, “Theater Thrills” (a cross-over short story with a character from SCRATCH-9), “Beauty and the Feast” illustrated by Kassandra Heller, “Comics For Everyone”, and a short story we only ever self-published, “Western Wit”! - I’m thrilled that we also included Chris’ very first ever Reed Gunther story from FIVE years ago! Reed and Sterling are very different folks in this story written by Chris. But Chris only finished 2 of the 3 parts he had planned, so the story was never complete. But for this collection, I wrote an ending that Chris drew and we finally wrapped up the first ever story of Reed and Sterling! It was a blast and is really a gem in this collection. - And to close it out, we’ve got pin-ups from ANDY SURIANO, CHRIS SCHWEIZER, SCOTT SHAW!, and VINCENT KUKUA! So basically, it’s worth checking out. Or you can read it digitally from Comixology or Graphicly. And if you haven’t seen it yet, I’ll leave you with the new video trailer for the second trade.